It is common to slice the beer world into two irreconcilable sectors. Lagers are the yin: cooling, clean and constrained; ales are the bold, brash, ebullient yang. When it comes to pairing with food, some have even made an analogy between white or red wines and lagers or ales. The mind seeks simplicity, so a trope like this may be useful for getting a grip on the bewilderingly diverse world of beer, but is there any truth to it? There are differences. For millennia, brewers fermented their beers at ambient temperature. But early on, they must have begun to realize that beers that were fermented cooler had better flavors and less chance of becoming infected or outright sour, as evidenced by large clay fermenting pots nestled in the earth in ancient sites. By medieval times in Europe, it was common to forbid the brewing of anything but small beers in the warm half of the year. Beyond that, the options were limited. Over the very long period of domestication, the vast majority of brewing yeast developed into strains adapted to room-temperature fermentation. At some point, possibly as early as the late 14th century, something happened. A new type of beer showed up in Einbeck, in Northern Germany. By 1420, it appears that the Bavarians may have been aware of it, although they were more into wine than beer. Eventually, this new type of beer became known as “lager,” from the German verb meaning “to store.” It was deeply embraced by Bavaria. Brewers noticed that the yeast tended to settle on the bottom of the tank as it fermented, giving rise to lager’s other name: bottom-fermented. It turns out that a new type of yeast had arisen, a hybrid of brewers’ yeast and a second, cold-tolerant species named Saccharomyces bayanus. It’s a historical mystery how lager arose. The commonly told tale about monks brewing in Alpine caves is as full of holes as the cheese there. High mountains are a poor brewery location for logistical reasons, caves are too warm for lagering, and, if you look at a map, the Alps are a very long way from the beer’s origin. Further complicating the picture, genomic studies have shown that the hybridization may have occurred several times, and there is at least one strain that is pure S. cerevisiae—the same as ale yeast. There is still much to be settled on this topic. But on to the flavor. Yeast is a complex little chemical factory. And as with all chemistry, when you raise the temperature, things happen faster. It’s not the most efficient of creatures, and it tends to allow chemicals generated at various steps of its metabolic processes to leak through its cell walls into the beer. Some of these chemicals have a lot of impact on the flavor of the fermented beverage. Since the key difference between ales and lagers is the fermentation temperature, this means ales have a lot more of these intermediates, known as “congeners.” Most important among them are esters with a wide range of fruity aromas common in ale, from banana to berries to apple and pineapple. And there are others. Depending on the yeast, phenolic compounds may add spicy notes, and in some circumstances, longer-chain alcohols can rear their ugly, hangover-boosting heads. Some of these chemicals remain in the beer only temporarily. Given adequate tank time, yeast will reabsorb chemicals like acetaldehyde (smells like raw pumpkin, wet grass, apples) and diacetyl (butter!) converting them into less obnoxious chemicals. While these two can come from other sources, they are often a sign of incompletely conditioned beer. Since lager beer is fermented cool—45–50 degrees F (7–10 degrees C)—and conditioned close to freezing, yeast spews far less of its flavorful byproducts into it. So the flavor of lager tends to revolve around its ingredients: malt and hops. Extended conditioning smooths out the beer as well; this easy drinkability is a big contributor to lager’s overwhelming dominance of the global beer market. Despite its subtlety, lager has a couple of aromas ale normally lacks. Many lager strains produce a fair amount of sulfur compounds, especially sulfite (SO4), with its burnt-match tang, and the rotten-egg aroma of sulfide (H2S). Either are acceptable in small amounts, and because they are highly volatile, they often vanish after a few sips. Because of the long contact time with yeast, beer may pick up off flavors from the yeast as it deteriorates. Most common are the sulfur compounds, ethanethiol and methanethiol, that may smell of garbage or sewer pipes. Neither is particularly pleasant; fortunately, they typically occur at a fairly low level. Trained noses, however, can pick them out. Because of the long tank residency, true lager is expensive to brew. As a result, most well-known American “lagers” aren’t quite what they claim to be. Rather than the six-week lagering of classic pilsners and other lagers, beers like Budweiser and Coors Banquet cut that time by half or more. Fermented warmer than traditional lagers, they show some fruitiness as a result: Budweiser has a hint of green apple, most likely from a mix of ethyl acetate and acetaldehyde, and ­Coors Banquet displays banana ester notes of isoamyl acetate. There are other beers that fit into this limbo between ales and lagers. Kölsch, the golden ale of Cologne (Köln), Germany, and its dark, hoppy cousin, Düsseldorfer altbier, from just down the Rhine, are both called obergärige lagerbier in German, meaning “top-fermented lager beer.” Often called hybrid ales, they are fermented cool by ale standards, but then cold-lagered, adding a clean smoothness desirable in sessionable beers like these. Both have a pleasant fruitiness. Kölsch uses a unique ale yeast that shares some similarities with lager strains, especially the propensity to throw a little sulfur into the nose. The American historical style California common is sort of the reverse. As brewers moved west in the mid-19th century, they coped with the lack of winter-harvested ice by brewing their beers with lager yeast, but at ale temperatures. Lager yeast does what any other yeast would do under those conditions: make a lot of fruity esters. So, despite the fact that it’s fermented with a lager strain, California common really is more ale than lager. Cream ale is another hybrid, in the old days literally so, as pale lagers were blended with a percentage of stock ale, a strong ale similar to a barley wine. These days they are brewed in several ways, but as just one data point, Pabst won a Great American Beer Festival medal in the cream ale category recently with its Blue Ribbon, a purported lager. Technically, the difference between the same recipe fermented into an ale and a lager is relatively small, and probably beyond the ability of the average consumer to discriminate without being prompted. A little bit of fruitiness is a small thing next to more impactful flavors of malts and hops. So the gulf between ales and lagers, at least in theory, is not that big. A more important difference, in my opinion, is that ales and lagers have been culturally separate for quite some time, allowing several families of styles to flourish independently for centuries. This led to more noticeable differences than fermentation temperatures alone. If you think about pilsner or Munich dunkel, for example, there’s no exact counterpart for either in the ale world, nor any lager version of an English bitter or an Irish stout. Styles have always been much more than technology, with local produce, methods, tastes and attitudes rolled up into them. This is the more important difference—not fermentation temperature. 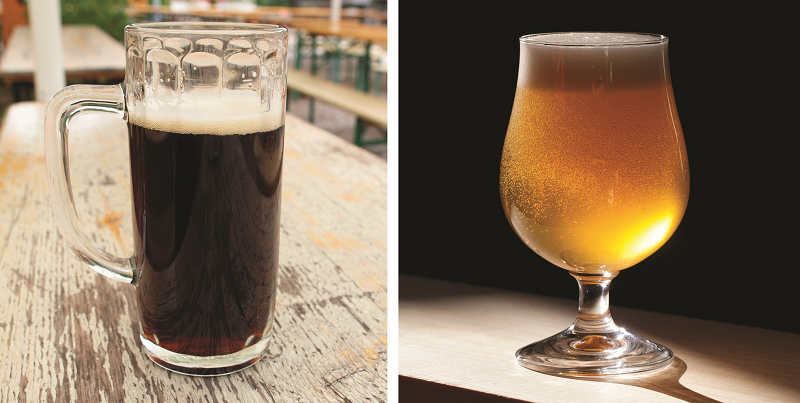 With craft brewing, the boundaries are breaking—or simply creating another stylistic path. Whatever the case, it’s great to celebrate the differences as well as the similarities. With people retreating to their tribes these days, it might just be time to make a bold move and bring lager and ale together into one big, happy, beery family. Prost … and cheers! It seems that in the US the term Lager has been redefined to mean a type of yeast. After 25 years of studying beer and brewing it is my understanding that in Germany, the birthplace of lagering, lagering is the process. Yeast is top fermenting or bottom fermenting. Therefore Kölsch and Alt would be top fermented lagers not ales. “…adding a clean smoothness desirable in sessionable beers like these.” What is a “sessionable beer”? We are not all beer geeks! The reference to isoamyl acetate and obergärige lagerbier weren’t the issue. “Session” was? great article. thank you. “bob” didnt have to be a jerk. Hey, if it’s beer and it has flavor—I’ll drink it! What role(s) does oxygen exposure play in the beer making process…good, and / or bad? Does oxygen affect more, or less…any particular type of beer, during, and after fermentation?